I have a confession to make - I love my sponsors! I love their products, the way they present them and their generosity in offering my readers amazing discounts! I am so delighted with the lovely collaborations and the creative support they are offering! I am truly amazed with the fast development of Kanelstrand Organic Living, the lovely friends I've made through it and the inspiring community we are building together, thank you! With the summer heat come a lot new opportunities and craves, so it is a wonderful time to continue growing your business. I hope that it will be a great opportunity to showcase your exciting work as independent artists or bloggers to like-minded people looking for beautiful goods made with love in a style fitting their philosophy of life. 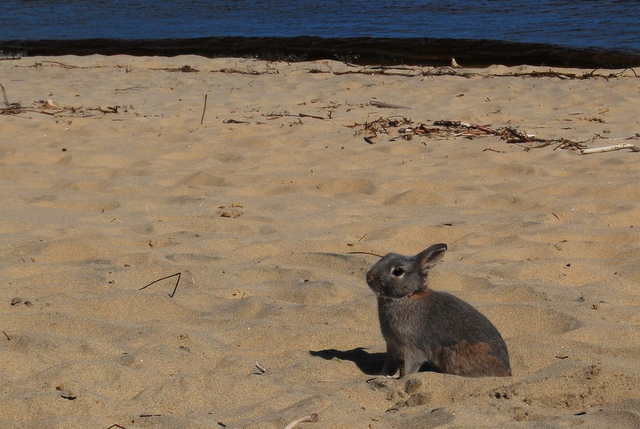 This is our bunny Muffin, who is already quite deep into summer beach adventures. With the incredible growth in readership of the Kanelstrand blog advertising will surely put you in the spotlight and increase the visibility of your indie business or blog! So, I am offering a few new ad spots for July, all at affordable prices, starting at $15! If you would like to advertise with Kanelstrand Organic Living, I would love to have you! You will get a welcome post, the option to share a coupon code to your stores and much more, Twitter and Facebook exposure included. Please click here for rates, blog stats and more information, and if you have any questions, do not be shy and ask, I am open to your creative ideas! Aw, such a cute bunny! That's awesome that you have such great sponsors. :) How great! What an adorable bunny and an awesome blog! I am now a follower of yours! I've never seen a bunny on the beach. He's so cute! I wish you continued success with your wonderful blog! Thank you, ladies! The attention I get from you is highly appreciated!